We had a great session last night with 14 members turning up for the Basic Assessment and Beginner sessions. This year has been a funny year particularly with new queens. 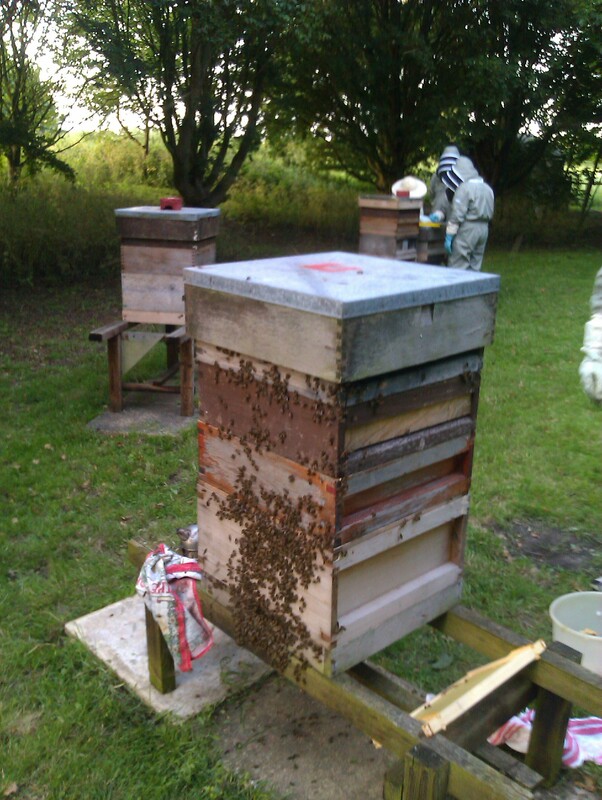 Last week one of our hives showed classic supersedure status, single sealed queen cell in middle of brood frame and queen present and laying, so the colony was left to get on with it. In the middle of our session last night the colony tried to swarm, the swarm was found hanging from the underside of the hive stand! Several members this season have reported new queens not successfully mating, resulting in drone laying queens, this was evident for the second time this season in one of our colonies. The variable weather and early build up seem to be contributing factors. There still seems to be little flow coming in causing some colonies to be a little defensive, but on the whole the colonies are well behaved and surviving well. However we could do with some prolonged good weather. The weather is due to improve later this afternoon so we still plan to run this evening’s session. If anything changes we will post an update at 17:00. You are currently browsing the Mid Bucks Beekeepers Association Blog blog archives for June, 2011.